In the last year questions of diversity and Classics have entered national and international conversations in higher education and beyond. I offer an eclectic sampling: Kwame Anthony Appiah, in a piece published by The Guardian in November, offered a historically-informed dismantling of the modern and self-serving invention of “Western Civilization.” The next month, in a short article for Inside Higher Ed entitled “Black Learning Matters,” friend of the department Bob Connor addressed disparities in access to subjects like Latin and Greek. Fall 2016 also saw the publication of Eric Adler’s Classics and the Culture Wars; articles supporting his book continue to churn discussion of the Classics’ role in American culture. All this without even mentioning the steady stream of think pieces in Eidolon addressing issues of access and equity pertaining to the discipline, some of which, like Johanna Hanink’s The Classical Debt, have developed into trade books. Why this sudden efflorescence? No stranger to the American culture wars (who can forget Jesse Jackson’s “Hey, hey, ho, ho, Western Culture’s got to go!“? ), Classics has been thrust once again into the frontlines of debate thanks in part to a global rise in nationalist sentiment. Despite obvious evidence to the contrary, a vocal minority now champions a narrow and deeply flawed interpretation of antiquity that sees in Greek and Roman culture a bastion and ideal of (“white”) European identity. Less of an intellectual affront, though arguably more pernicious in marking out Classics as a domain of white privilege, is the staggering lack of diversity within the field itself. 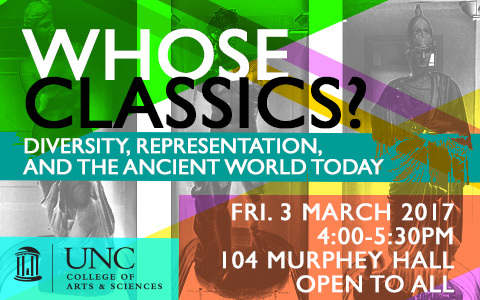 Classics lags behind nearly all other academic disciplines in incorporating historically underrepresented minorities, from first-year students to faculty. This should come as no surprise when spurious connections between Classics and ethno-nationalism enjoy such wide currency. We are caught in a vicious cycle. With generous support from the UNC College of Arts and Sciences Diversity Liaisons’ Office, the widely advertised event featured four “snapshot talks” by graduate students and faculty on a range of topics: James Rives surveyed religious tolerance in Rome; Sharon James and Hérica Valladares offered verbal and visual perspectives on the cult of Isis in Rome; Jim O’Hara and (newly minted) Dr. Tedd Wimperis on the ethnicity of the enemy in epic, while I mapped some of the challenges, ancient and modern, posed by African appropriations in Attic drama. The event drew a capacity crowd that ranged from first year undergraduates to emeriti and included representation from the College of Arts and Sciences administration. Also in attendance was Caroline Stark, Assistant Professor at Howard College and Visiting Faculty Fellow at Duke University this past academic year to support her “Io Project”, a digital resource on the reception of Classics in Africa and the African Diaspora. The Department looks forward to similar outreach events in the future, bringing fresh audiences and perspectives to complex cultural issues, such as empire and identity, that remain as vital today as they were in antiquity.